Home » Android Phones » Samsung Galaxy Note 7 » Samsung Galaxy Note 7 using 6GB RAM? When launched, the Galaxy Note 7 equipped with 4GB of RAM. But for the Chinese market, Samsung set up a variant with higher capacity capable. The information revealed on the official website of the Chinese certification bodies, TENAA. 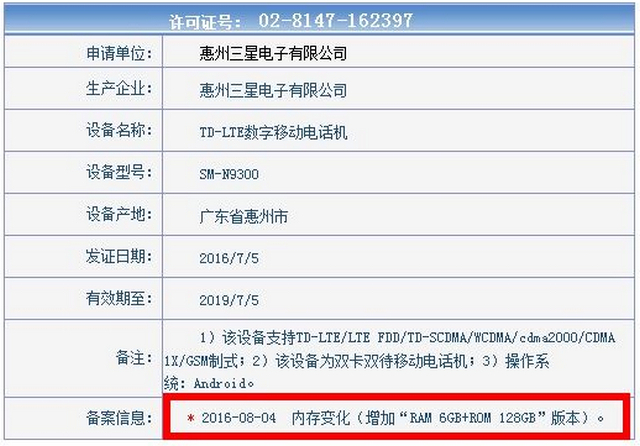 They post the specifications of the device with the SM-N9300 code on Thursday (04/08/2016). According to information from GeekBench, SM-N9300 Galaxy Note 7. However, the mobile phone has shown offal higher than that introduced a few days ago. The device carries measuring 6 GB RAM. While the storage space of 128 GB internal, as reported by the Gizmochina, Friday (08/05/2016). If this is true, it would be very interesting. Its performance will be speeding. Scores are inscribed in banchmark testing is likely to be higher than the variants of the Galaxy Note 7 with 4 GB of RAM. So far Samsung has not confirmed the news about this. It could be that they present a mobile phone to rival some Chinese vendors are already carrying the 6 GB RAM. The range of specified phones are Vivo Xplay 5 Elite and OnePlus 3, ZTE Axon 7 and Nubia Z11, and Leeco Le Max 2. 0 Response to "Samsung Galaxy Note 7 using 6GB RAM?"